El Dia de los Trabajadores is celebrated all over the world. Costa Rica is not an exception and that's why the first day of May was full of celebrations, parades and fireworks all over the country. In Puerto Limon its highlight is a traditional cricket match, in San Marco de Tarrazu there are street fairs and bullfights (without the bloodshed though) and parades with music, dancing and traditional food are held in Escazu. The first day of May is not only appreciated for the free day we get, but also for its first sign of Summer. The happy summer season is about to come, so you better get your "sombrillas" and boots ready! The first day of May we celebrated with a Graduation here, at ILISA. This time it was a little emotional since we were saying "Bye" to one of our long-term staying student. However, everybody was happy with all the accomplishments and achievements they reached during their courses and we are hoping to meet again very soon! Our Summer program is still open for new applicants, so if you are thinking about what to do this summer - how about travelling, exploring new cultures and also gaining some educational experience at the same time? 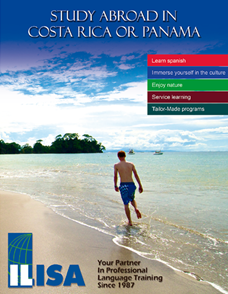 ILISA gives you the best choices for your language practice and travel desires at once. Our registration for this Summer has already started!! Check this for registrations! As Costa Rica is considered the birthplace of ecotourism, its coast is home to dozens of important nesting beaches for four turtle species—leatherback, green, hawksbill, and olive ridley. Summer is the best season for visiting the beaches and watching the turtles to nest as it is the period when most of the species are active and it is possible to see the most of them. Here at ILISA we organize all kinds of excursions for our students, The National Park Tortuguero included. You shouldn't miss this chance to see the nature at its own beauty once visiting this beautiful tropical country! What jumps first on your mind when you hear the two magical words "Costa Rica"? The right asnswer is: Empanadas! Brown the ground beef in a frying pan adding the salt and pepper just before done. Let the beef cool. In a large bowl mix the corn, onions, cheese, and salsa, then add the cooled beef mixing carefully so not to break up all the cheese. Roll the biscuits out flat to about 2-1/2 times their size. Place approx 1/3 cup filling on one side of the center of the circle lengthwise. Fold the dough over the filling like a turn over and crimp the edges like a pie crust. Be careful not to tear the dough, and to seal the edges completely or your filling will come out! depending on how much filling is used will determine how many biscuits you will use. Place on slightly greased cookie sheet and bake at 375 till lightly browned. Copyright © 2015. ILISA. All rights reserved.